France and Russia have agreed to exchange intelligence data on Islamic State and other terror groups in Syria to increase the effectiveness of their air campaigns in the country as Vladimir Putin received his French counterpart, Francois Hollande, in Moscow. “France is ready to work hand in hand with Russia to achieve a common goal of fighting terror groups and Islamic State in the first place,” Hollande said after the talks on Thursday evening. The two leaders have agreed that French and Russian airstrikes would be focused on Islamic State (IS, formerly ISIS/ISIL) and other jihadist groups and facilities under their control. “What we agreed, and this is important, is to strike only terrorists and Daesh (Islamic State) and to not strike forces that are fighting terrorism. We will exchange information about whom to hit and whom not to hit,” Hollande added. Putin emphasized the key role played by the Syrian army, which is loyal to Assad, in tackling the terrorists in the country. “We all believe that it’s impossible to successfully fight the terrorists in Syria without ground operations,” he said. “And there’s no other force to conduct ground operations against IS ... except the government army of Syria. In this regard, I think that the army of President Assad and he himself are our natural allies in the fight against terrorism,” the Russian leader explained. 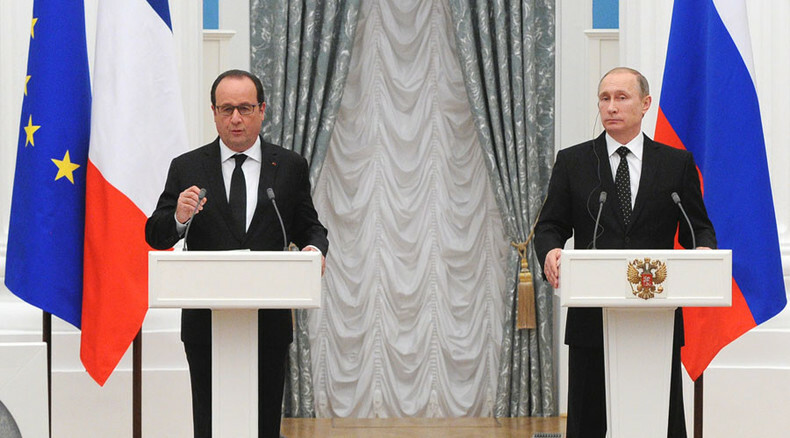 The French leader also stressed the importance of Russia playing a key roles in the political transition in Syria. However, he reiterated the Western position that Syria’s current President Bashar Assad should have no place in the country’s future. Putin again spoke about the need for a broad international coalition against terrorism and jihadism without any reservations, but added that Russia is ready to act on its own if the idea does not receive wider support from the West. The two leaders agreed to continue their dialogue on Syria during the Climate Change Conference which is due to take place in Paris between November 30 and December 11.